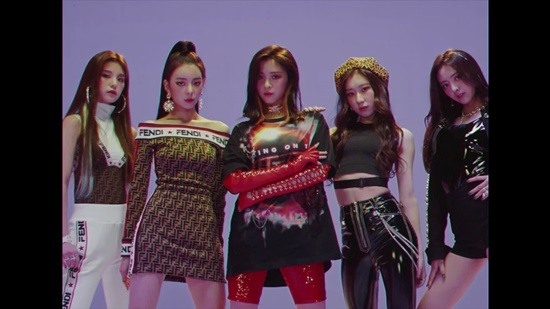 JYP Entertainment has unveiled its new girl group, “ITZY,” and the five-piece band is already setting the music scene abuzz. Consisting of Chaeryoung, Ryujin, Yuna, Lia and Yeji, the band marks the first all-girl act from the major entertainment company to debut in four years, since Twice. The group’s official YouTube channel was created on Monday, and a trailer uploaded on the company’s official channel titled “Prologue Film: ITZY? ITZY!” had racked up over 1.2 million views as of Monday morning. Each member was heavily accessorized and put on a fierce front. Yuna cut a stylish figure in a black studded jacket as she held a glittery megaphone. Sporting a pair of red gloves and leaning toward a gold shopping cart, Ryujin oozed confidence. Ryujin has appeared on the JTBC reality show “Mixnine,” while Chaeryoung, the younger sister of IZ*ONE’s Lee Chae-yeon, has appeared on a number of audition programs. As the word “Itzy” in Korean means “I have it,” the group’s content is being shared on Twitter with both the English and Korean hashtags. The official date of their debut has yet to be revealed.